Last Sunday the newly wedded couples gave us a visit at home and I was really worried on what to give them for their first visit. With my Husband, I decided to prepare the my mom’s special beef roast (beef ularthiyath). We quickly arranged all other dishes and started preparing the beef roast for them. The couples enjoyed all our dishes and especially the beef roast. Enough of praising my food, you will get bored. Try this recipe and I am sure you will also love it. Kerala Beef Roast Recipe preparation. Cut the beef it into bite sized pieces and wash it well under running water. Pressure cook the pieces along with turmeric powder, red chilly powder, black pepper powder, coriander powder, garam masala, chopped ginger (1tbsp) and salt with 1 cup of water (6-8 whistles). Grind the dried red chillies into a fine powder in a mixer. In a pan, pour 2 tbsp coconut oil and add the ginger (remaining 1tbsp), garlic, green chilly, curry leaves, onion and saute till it turns light brown. Add the grinded red chillies to the pan and saute. Add the cooked beef to the pan and mix it well. If needed add some more coconut oil. Cover the lid and keep it in medium flame for 20 minutes. You can saute it in between. Serve with rice, appam, idiyappam or puttu. How to make Kerala style Beef Varattiyathu? 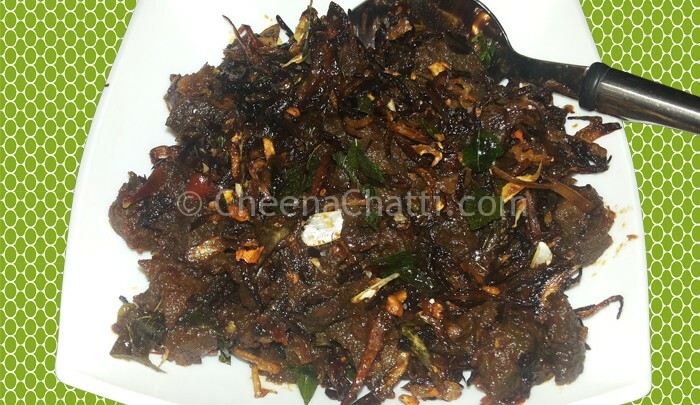 This entry was added on May 22nd, 2013 by Renoos in Non Veg and tagged with beef fry, iftaar recipes, beef roast recipe, how to make kerala beef fry, kerala beef recipe, beef ularthiyath, taste of kerala beef fry, kerala beef roast recipe, ramzan recipes. Last revised on April 1st, 2018. @Bindhu Suresh : Thanks for the comments :). Don’t forget to share your experiences with us. thanks for your receipes…..its really helpfull…..i tried some of them….got appaluse frm my family…. @Priya: Thanks for stopping by and trying our recipes. Glad to know that they worked out well for you… Stay connected. @Princy: thanks for notifying me about that. Just updated the post. Dont we need to add tomato? @Mohammed: its optional and depends on your personal preference. You can add it in Step 4 if needed. @Jincy: coconut pieces are optional. I skipped them. If needed, you can include it in step 4. @Neha: Salt is added in step 2 along with powders and masalas. Tried this and came out very tasty..Thanks for the recipe..
My family likes it very much. Hello Kitchen Doctor! Thanks a “Beef” tonne for this recipe, had a finger licking, lip smacking and a drooling experience. Enjoyed this spicy beef roast with tomato rasam, steaming hot rice, papads and Andhra pickles. Sprinkled the finished roast with fresh lemon juice and it was very very flavorful. Thanks again. Tried out the Beef Roast..Came out to be pretty tasty…Did not get the Squid yet to try out the recipe..
Do let me know after trying squid also..
ഒരു ചെറിയ സംശയം ചോദിച്ചോട്ടെ?,ഒരു കിലോ ബീഫ് നു മേല്‍പ്പറഞ്ഞ കാല്‍ tsp മഞ്ഞള്‍പ്പൊടി ,അര ടി സ്പൂണ്‍ ഗരംമസാലഒരു ടീസ്പൂണ്‍മല്ലിപ്പൊടി ഇതൊക്കെ മതിയാകുമോ?മുളക് ഓക്കേ ആവശ്യ ത്തിനുണ്ട്. I don’t know what made it look different. May be as I didn’t keep long to drain the water from meat. It came out well. But with more gravy. We loved this thick gravy as well. Thanks a lot for the recipe dear. tried the recipe last weekend , it came out lip smackingly awesome , added puree or 2 tomatoes as we like a tangier taste. simply awesome. Thank you doc… Im aacollege student and stayng on my own.. All these days i used to go to hotels for food and this was actually my first try to cook beef fry… OMG it was suuper awsome…and really encouraging me to cook more… So thanks a lot for the tips… Loved it !!! @Srikiran: Thank you Srikiran, for trying the recipe and for your encouraging comments. Happy to know that the preparation came out well for you. The main reason why we started this blog, was to promote homely / healthy foods and to avoid youngsters going behind hotel foods. Hi! Won’t 2tsps red chilli powder plus 10 ground chillies and 3 green chillies make it very spicy? @Shobha: The quantity of ingredients given above is same as what we used at home, but I assure you, it was not very spicy. If you feel so, try reducing the number of red chillies. Depending on the variant of chillies used (spicy / non spicy), try adjusting the numbers. No the dish wasn’t spicy. I cooked the dish as per the recipe and it was perfect. Don’t know if the beef gave out too much water but after taking from pressure cooker there was just too much curry. I did evaporated as much curry as possible but it felt a bit over cooked. The taste was superb. @Varun: thanks for trying the recipe and dropping your feedbacks. Glad to know you loved it. Updating straight from the kitchen. Oru reksha ila, super recipe. mouth watering and couldnt wait for the rice to be ready. we started eating already. Thank you so much for the wonderful recipe. @Jayashankar: Thanks a lot for trying the recipe & also for leaving a comment here. I’m so glad that it came out well for you. Hi Renoos…excellent receipt… Tried it at home and it came out really well. Looking forward to many more…thanks!!!! Tried it out today, it was finished just like THAT! A good experience for me since my meat dishes are not usually so successful! This is a keeper for sure. Thanks for sharing the recipe! My mom and dad loved it much! Really this is the best one i ever did! Glad to know your preparation came out well. Thanks for trying the recipe and your encouraging words.